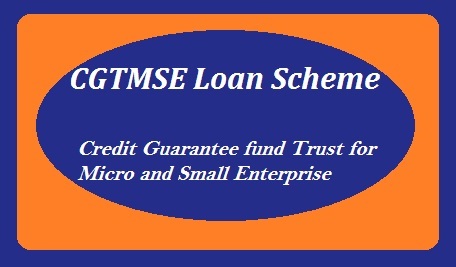 CGTMSE (Credit guarantee fund Trust for Micro and Small Enterprise) is a loan scheme launched by the government to help small and micro business entrepreneurs flourish. The scheme is aimed at offering assistance to business enterprises via different banks and financial institutions in the country. It offers with required financial assistance from 5 lakhs to 65 lakhs for micro and small enterprises for establishing their business. The main objective of the CGTMSE scheme is to encourage new entrepreneurs for implementing new and innovative business ideas via SMEs. The scheme is also aimed at offering guarantee regarding availability of credit for both lenders and borrowers in the form of financial security for their business. Under this scheme it is certain that business owners will be provided with capital and term loan to invest in their business plans. Eligible lender – Under the scheme all private and public sector commercial banks, NSIC, Rural banks, NEDFI and SIDBI are a part of the scheme. It is also certain that these banks have to sign a valid agreement with CGTMSE to get enrolled to provide loan to the borrowers. Eligible borrowers–old and new (Micro and small) enterprises are both eligible for availing financial assistance under the scheme who are willing to implement innovative ideas. Under the scheme the borrower has to pay the interest rate as charged by the respective bank or financial institution. The CGTMSE offers with service fee and guarantee fee that has to be paid by the borrower to the bank. The rate of interest charged to the former is around 1.5 percent and the latter has to pay around 0.75 percent rate of interest on the total loan amount. The application form can be filled in on the official CGTMSE website. Apart from this the applicants can also collect the forms from various banks and financial institutions. Before filling in the loan application you may have to check with the respective bank for eligibility with CGTMSE for providing with the loan. The loan amount is credited in the borrowers account by the bank on the basis of the project report submitted and fixed asset presented as security to the bank. It is also certain that the applied loan amount by the applicant should cover working capital and term loan amount to invest in the business. It is also important that both term loan and capital should be credited by the same bank. The bank shall provide lenders with normal interest rate, service fee and credit guarantee as decided by the bank. Under the scheme it is certain that the bank will offer an interest rate to the borrower around 3 percent per annum as per the RBI’s guidelines. Apart from this the borrower will also have to pay service and credit guarantee fee to the bank as per the banks guidelines. It is certain that the women applicant under the scheme will be provided with 80 percent coverage if the loan amount is around Rs 5 lakh to 50 lakhs. If the loan amount exceeds Rs 50 lakhs to around 100 lakhs then women applicant will be given a coverage of Rs 37.5 lakhs along with 50 percent of the loan amount. To get the loan amount the applicant will have to form a business entity prior to applying for the loan under CGTMSE. A detailed project report for the business plan has to be submitted to the bank by the applicant when applying for loan. The applicant has to provide with details of business plan, experience and amount needed for establishing the businesss. The applicant then has to try and obtain the sanction of the loan amount from the respective bank under CGTMSE. The moment the loan amount is sanctioned by the bank then the applicant has to obtain the coverage under the scheme depending on his or her criteria. Officially there are around 130 different nationalized and private banks and institutions that shall provide with required financial assistance to the enterprises for establishment. State Bank of India and other state banks, HDFC bank, ICICI bank, and other banks from both public and private sector are involved under the scheme for providing assistance to the enterprises. Under this scheme it is certain that the borrower will be given a credit guarantee by the financial institutions and banks. As the amount will be made available in the borrowers account such that the borrower can withdraw capital and loan amount at their own will for investing in the business. The government has also stated that if any loss is incurred by the lender or if the borrower fails to make the repayment of the loan amount then the lender will be provided with 85 percent amount for covering up the loss. Under the scheme the government has assured that it will cover all types of businesses for micro and small enterprises excluding retail business. The benefit will be offered to all micro and small enterprises that are involved in service or manufacturing business. This benefit can be used by both new and old business enterprises. Business from agricultural, educational, micro manufacturing, self help groups and training centers will get the benefit under this scheme. All other types of businesses that are stated under the RBIs rule including MSMED and private sector are eligible under the scheme to be benefitted. Under the scheme it is certain that micro enterprises shall avail around Rs 5 lakhs financial assistance and Small enterprises shall avail Rs 65 lakhs financial assistance from the banks. One of the main benefits to the enterprises is that the loan procedure shall not involve mortgage of collateral for availing the loan amount. The loan amount will also be credited directly in the applicant’s bank account such that the money can be used by them in running their business. The scheme has been launched by the government to offer credit for all small and micro enterprises via leading public and private sector banks. The government along with SIDBI has launched the drive with an aim to help boost the present credit system for enterprises.